Most daycare centers don’t allow cloth diapers. Which makes total sense. Not everyone has access to a washer/dryer and some laundromats don’t allow washing cloth diapers in their machines for sanitary reasons. Also, while you sit at the laundromat there is a child to think about – entertain them or find a sitter. There’s the time factor – regardless of income or situation, time is a critical consideration for any parent. Some parents are working multiple jobs, or have to travel to launder the diapers and there often just isn’t enough time. 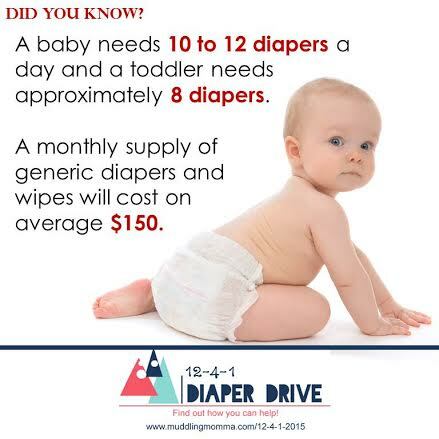 There are quite a few cloth diaper banks based on my quick Google search, but right now the practical solution is to help provide diapers to low income families to quickly solve their immediate need. To help out, visit my Go Fund Me page or the 12 4 1 Diaper Drive page. Last year I was humbled to deliver 8100 diapers (and thousands of wipes) to St. Martin’s Ministries in Ridgely Maryland. 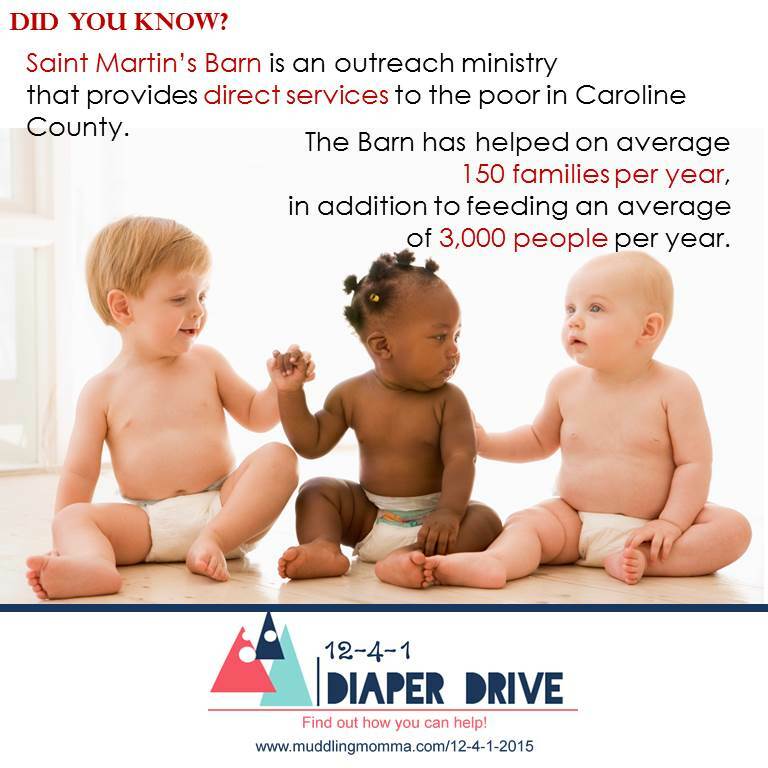 Those diapers went to Saint Martin’s House, a transitional residence where homeless women and children can work towards self-sufficiency in a safe and stable environment. St. Martin’s house opened 17 years ago and has been home to more than 600 women and children. The average cost of housing residents in a one-year period is $55,000 and while they are staying there, they learn parenting, budgeting, and household management skills. They are also offered counseling services and assistance preparing for their GED, enroll in college courses, and find employment and permanent housing. I am happy to be able to serve such a vital organization where I grew up. This year we are going for 10,000 diapers and partnering with Choptank Transport. Find out more here, or to donate money visit my Go Fund Me page. 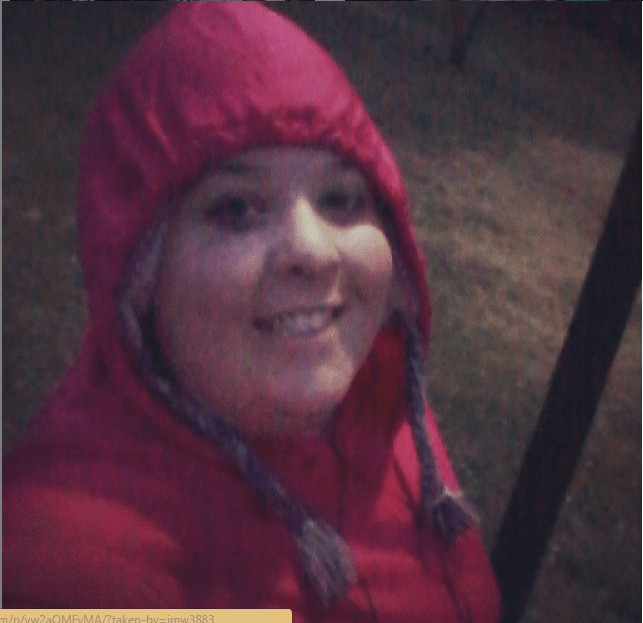 Running? There is nowhere I need to be that quickly. If I am running, you better run too because something is chasing me. 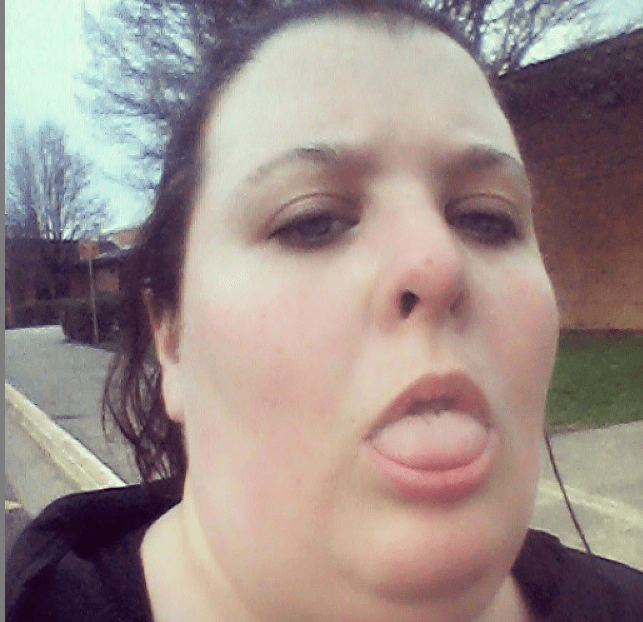 I am too overweight to run. I’ll run, run to Dunkin Donuts real quick in my car. 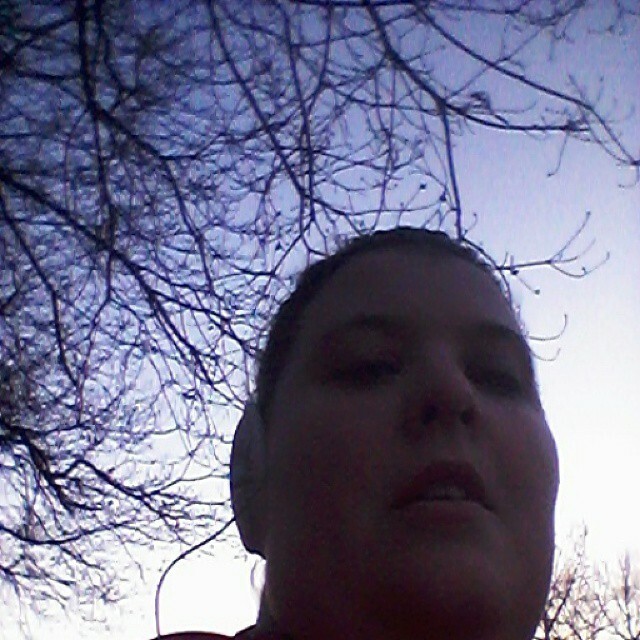 What do you THINK about when you run? It seems so boring. You never know when you might want to try something that at one time seemed so ridiculous. 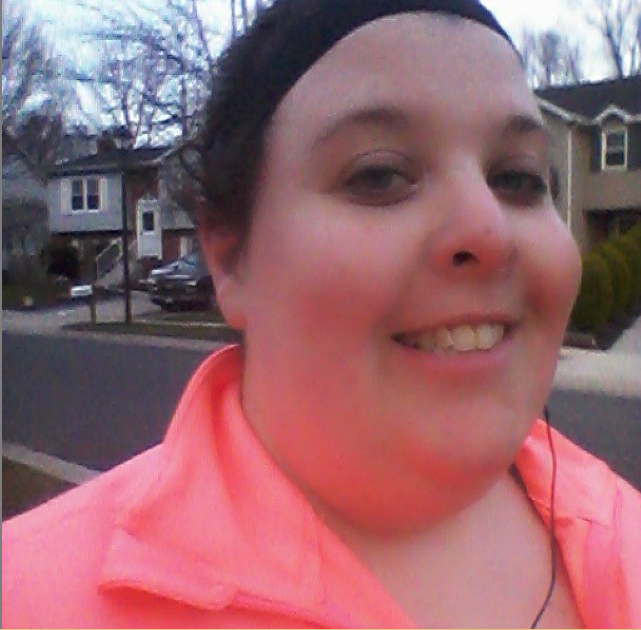 Thanks for hosting my first virtual 5K Fit, Fab and Lean! Mike’s been saying ‘ho, ho, ho’ lately and sometimes it’s appropriate. Most the time he is pointing to a garden gnome or anything that has red or white stripes. That makes sense – Santa Clause. 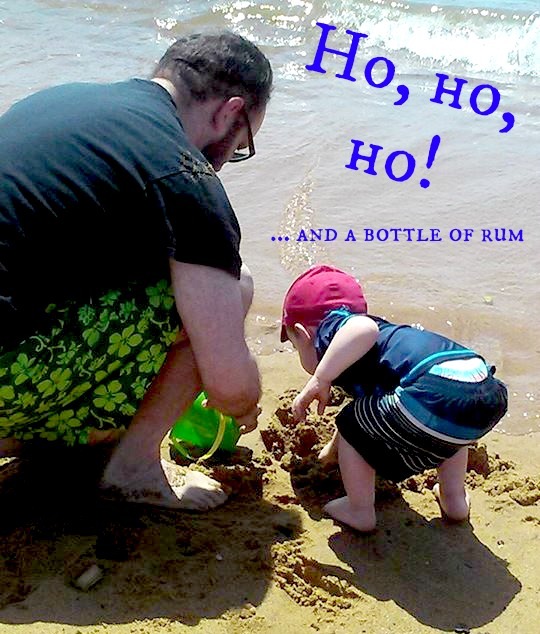 But recently he is saying ‘ho, ho, ho’ at the beach which had S. and I puzzled. UNTIL he brought us a bag of Pirate’s Booty Puffs saying ‘ho, ho, ho’. Mike likes Jake and the Neverland Pirates. He isn’t saying ‘ho, ho, ho’. He is saying ‘yo, ho, ho’! You know. Like a pirate. Duh. I see them in the darkest skies. I’ll love you till my dying day. I can’t help but feel a little bittersweet about your 2nd birthday tomorrow. I know Daddy feels the same. We miss have a little baby to snuggle, but now we have a big boy to snuggle! And you are the snuggliest. You love to bury yourself between Daddy and me in the bed and pull up the covers demanding ‘sea-goo’ time. Sometimes you even grab our arm and drape it over you. If you catch Daddy and I hugging, you run right up and want in on that action. You are truly our little love bug. This has been an exciting year for you! Right before your first birthday last year we were watching and waiting for you to take your first steps unassisted. Now you are climbing on chairs, maneuvering up stairs and fearlessly walking back down. I won’t even mention chasing you as you squeal with glee. You’ve gone through some other changes as well. 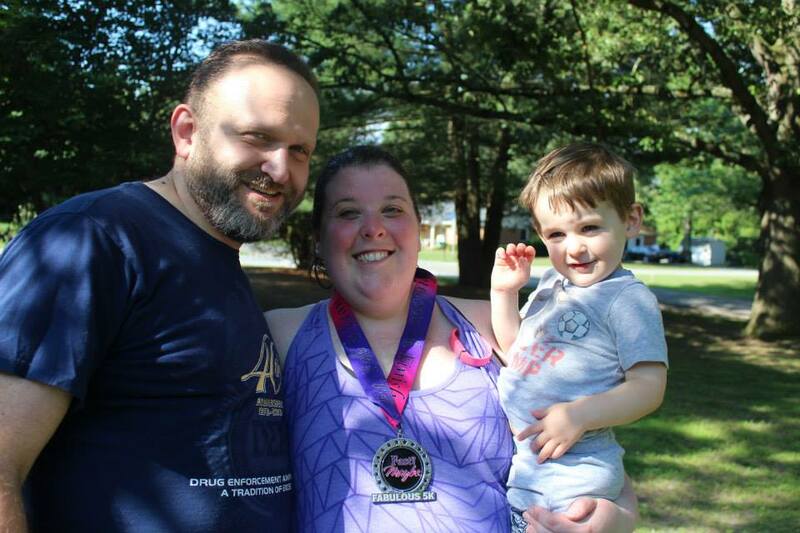 We made the big move from Centreville, Virginia to Crofton, Maryland in January for a variety of reasons and none that we regret. The main reason was to be closer to family and this has proven to be so beneficial. Your Bubbe, Grandma and Grandpa have visited often and we have seen Mollie a lot. Daddy and I are thrilled you will be growing up closer to the family that is so important to us. With the move came a new daycare. It was obvious by day 2 that I worried myself sick about nothing. You have flourished there, learning new things and making friends. You give me a hug, go to Miss Rachel and immediately you are waving, saying ‘au revoir’ and blowing kisses. If you do cry it is once in a blue moon and probably only for my benefit. Oh my love, you do have your moments like we all do. You have mastered the ‘lay down on the floor and fake cry’ quite well, but it never lasts long and you are always quick to come find us so we can move on with our day. You can’t keep up the grumpiness for long, I don’t think it’s in your nature! 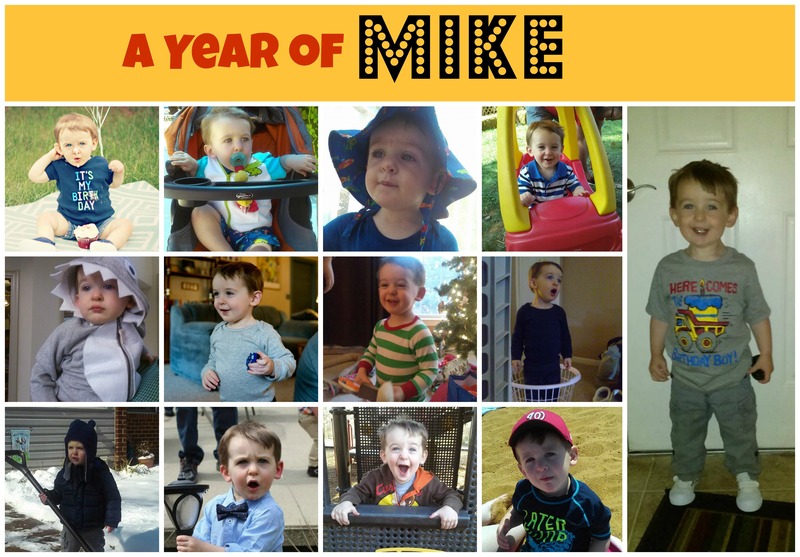 Mikey, as you turn two my biggest wish for you is to know how much you are cherished and adored. You are growing into quite a kind, easy going, and hilarious kid. These are all things your Daddy and I dreamed about while watching you roll around in my tummy. Yes, I have neglected to write you a letter the past few months. However, your birthday is right around the corner so I have a whole year to review. But I wanted to capture yesterday and your need to sea-goo (snuggle). 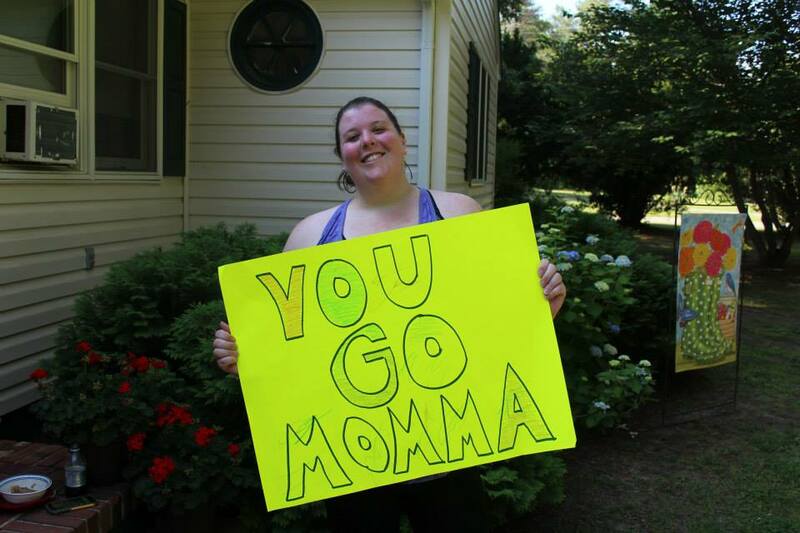 Yesterday was the day that Mommas (and Daddys!) live for. From the minute you woke up to the minute you got in your crib you just wanted to be close to someone. And guess what? I was able to give you that. When you try to say ‘snuggle’, it comes out as ‘sea-goo’ and usually involves a blanket. Yesterday when everyone got home, you were happily playing with your car in the living room while I watched from the futon. I stood up to make dinner and you said ‘sea-goo’ and pointed to the futon. When I didn’t comply right away, I realized that this wasn’t a request — it was a demand. Daddy happily took over dinner so I could lay on the futon while you played next to me. 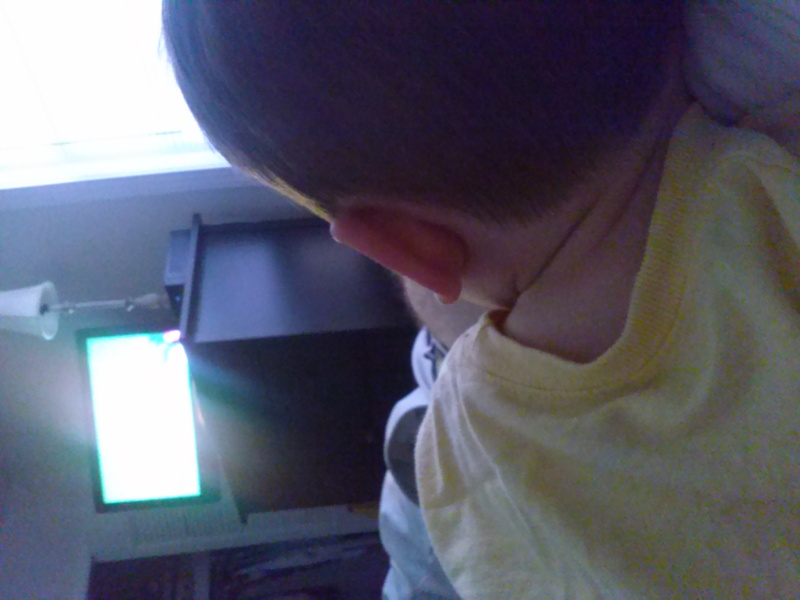 Our after bath routine is pretty standard and includs snuggling between Daddy and me while watching Mickey Mouse Clubhouse. You were very content with us all under the covers. And when bedtime came, you picked out a book (the first time in months you showed an interest in reading) and hopped right in my lap and sat through the whole story. Sweetie, sometimes we all need to sea-goo and I hope, even as a big boy, you always feel like Daddy or I will sea-goo with you when you need it. Sometimes I even sea-goo with Grandma! You and I both got what we needed yesterday and that makes me a happy Momma. I’ve been pretty quiet lately, mainly because my blog is going through a branding upgrade thanks to a fabulous friend of mine! Once that is in place, I will be back to my regular posting and updates. HOWEVER, it has been gorgeous out and since everyone is working on their backyards, I wanted to share Mike’s Rock Box. I found this idea when I suggested getting Mike a sandbox. S. couldn’t stand the thought of sand EVERYWHERE and it didn’t take much convincing for me to agree. I cruised alternatives and Mike’s Rock Box was born! A few people asked how I made it and guys? It’s stupid simple. Use the drill to pop a few small holes in the bottom so when it rain, it will drain and not give you a pool with rocks (though that might be fun too). 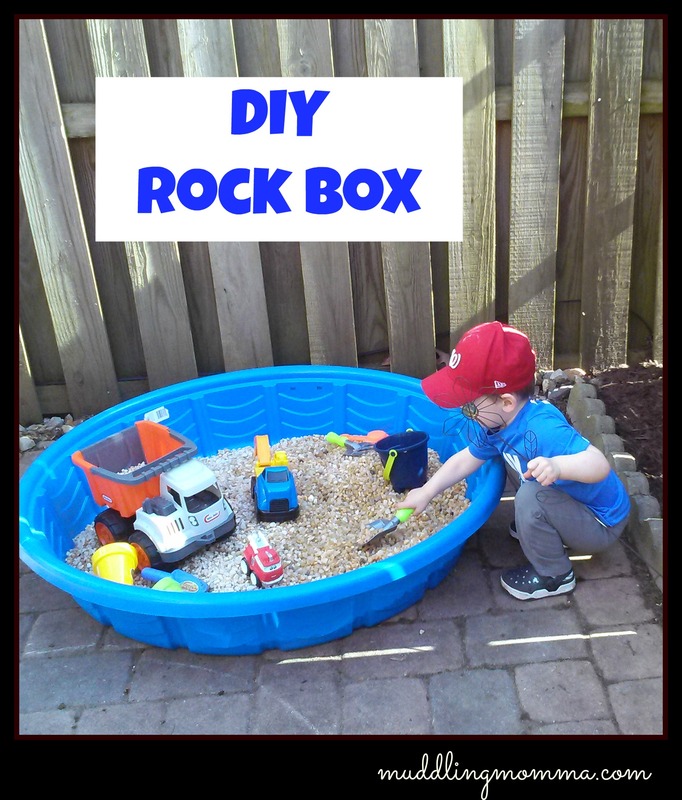 Toss the rocks in the pool with a few toys and let your little construction worker at it! I can’t even believe you are turning 2. 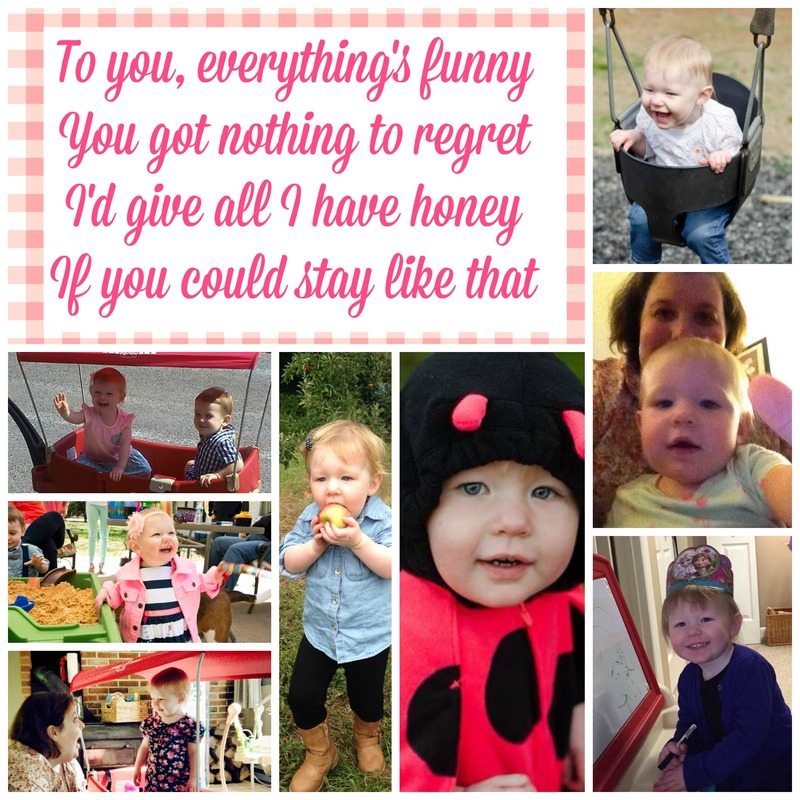 I remember writing you your 1st birthday letter and here I am reflecting on yet another year with you my sweet niece. Honestly, not much has changed. You are still just as beautiful, sweet and mischievous as you were LAST year. Perhaps this year you just have more hair. I have so many favorite memories of you from this year I can’t pick just one. Most of them involve your milestones and how you interact with Mike. You are so kind with him and we can tell he is watching you to see how things are done. One time you had me giggling was at your Daddy’s birthday you took your plate into the kitchen in hopes of a piece of cake only to come back into the room VERY upset your request was denied. A kid after my own heart! I love you Mols, have a happy happy second birthday.